Anyone looking at who gets elected to local government in New Zealand will be struck with the lack of diversity of representation. While some may vote to counteract it, the fact is the majority of electors who do actually vote are greying white folk who tend to choose people like them. My general proposal to promote diverse representation is a quota system. 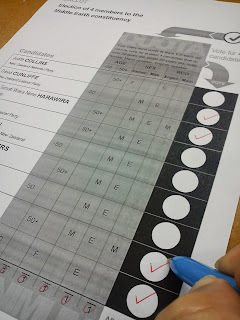 However the quota is not to be applied after the vote, it is to be applied on the ballot itself with the voter making their choices conforming to the minimum requirements of the quota (which is more democratic). So this proposal ensures all valid votes are in conformity with quota, but does not predetermine the outcome. It makes it more likely, much more likely, that a wider selection of different people are elected than present (along the three main relevant social divisions), but there is no guarantee as such. The proposed quota items are limited to three because any more really starts to get complicated. I have chosen the central ones of age, gender and culture (yes language rather than race). The quota is only workable in multi-member constituencies (making it suitable for most local bodies). Maybe slightly confusing to start with, but I put concise instructions at the top and a "minimum" underneath to emphasise the point of the quota. I gave one to someone without telling them anything and they managed to complete it without problems, so I'm hopeful it may be of some use. 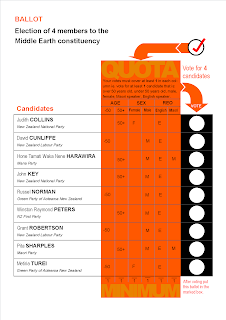 In a situation where there is only one candidate filling the quota then that person is elected and that quota item drops off the ballot (leaving the other two) and the number to be elected is reduced by one. 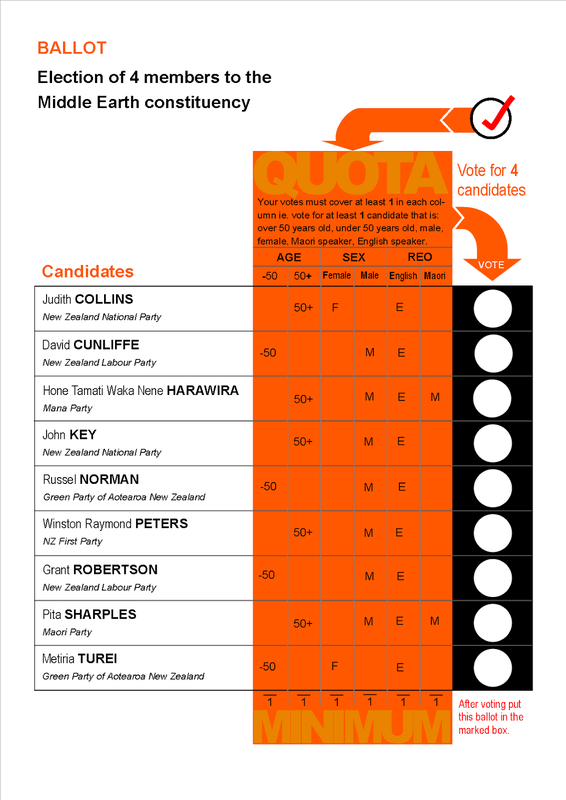 This quota ballot could be used for any number of items and any number of positions in a multi-member constituency. this is great, why not go the full way, the social engineers could tick the boxes for us,and send a letter telling us who we voted for. I can't really see the public going for the idea of correct political voting. We have this quaint idea that we should vote for who we wish. This is wonderful. Napoleon and Snowball would be so pleased.